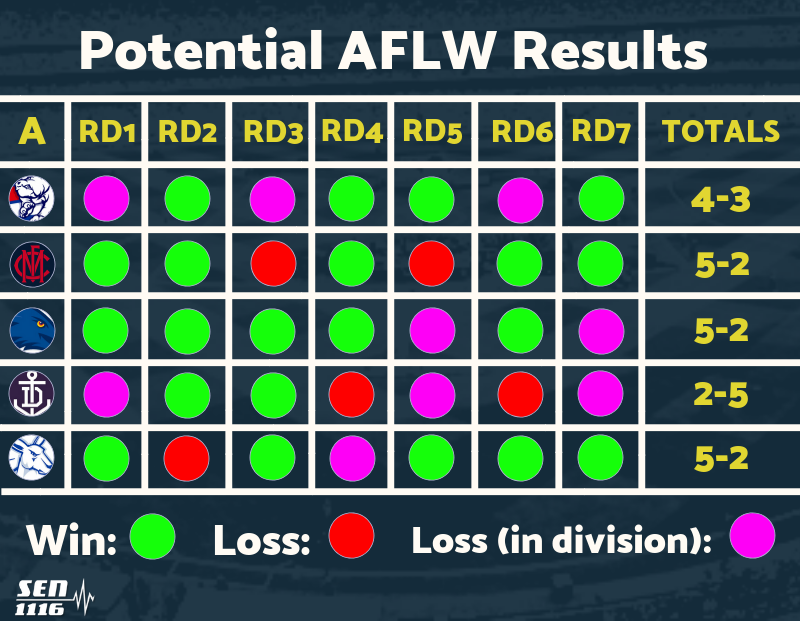 The AFL last week announced the fixture for the 2019 AFLW season; the highlight of which was the reveal of a conference system that breaks the teams into two groups of five. The way the league was split was simple enough, with the teams that finished one, three, five and seven in one conference and two, four, six and eight in the other. North Melbourne and Geelong were then added afterwards. Unfortunately, while the AFL made the logical call in the way they split the conferences, it may create an imbalance. Four of the five strongest teams heading into the 2019 season appear to be in Conference A, with reigning premiers the Western Bulldogs, Melbourne, North Melbourne and first-season winners Adelaide all grouped together. The Dogs and Dees have lost key midfielders with Emma Kearney heading to North Melbourne and Daisy Pearce pregnant, but both still boast enough match-winning talent to be tough to beat in 2019. Adelaide struggled last season, but Erin Phillips’ persistent injury issues played a big role in that. With Phillips fit and firing in addition to the sneakily good pick up of former GWS marquee Renee Forth, the Crows will once again be a contender. They also play three of their first four games at home, giving them a chance to get off to a flying start. North Melbourne took a much more aggressive approach to their signing period than fellow new club Geelong, grabbing reigning league best and fairest Emma Kearney. On top of that, they added All-Australian ruck Emma King and Brisbane midfield duo Kaitlyn Ashmore and Jamie Stanton. They should immediately be among the best midfield groups in the competition. Throw Jasmine Garner, Moana Hope, Jessica Duffin, Danielle Haridman and other ready-made players into the mix and you’ve got a strong core to build around. Meanwhile in Conference B, you have last year’s runners up in Brisbane who should still be as strong as ever. They’re a very well-coached unit that have consistently shown the ability to completely shut down opposition teams’ capability to score. Behind them, there’s nothing to say GWS can’t win four or five games either, but on paper, they would rank just behind the aforementioned four teams in Conference A.
Collingwood was hit incredibly hard by off-season changes, losing King, Duffin, Garner, Hope, Christina Bernardi, Amelia Barden, Meg Hutchins and now Chloe Molloy to a season-ending injury. Expectations for them would have to be low at this stage. Carlton meanwhile had a 2018 season to forget and under new coach Daniel Harford, will have to prove they can compete. The Blues lost their last five games and finished the season with a percentage of 54.1. As mentioned, Geelong took a less aggressive approach to free agency, which allowed them to pick up some diamonds in the draft. The bulk of their team has spent time together at VFLW level meaning they should have immediate chemistry. Throwing number one draft pick Nina Morrison, number two pick Sophie Van De Heuvel and another star in Olivia Purcell into the mix puts them on the right track. Long term, they’ll be in a great position, but 2019 will presumably be more of a building year for the Cats. To sum up, Conference A could dominate the competition, which would skew what the finals series looks like. The two top teams from each conference make the finals, but Group A could end up with something like 10 more wins than Group B. The fourth seed in Conference A may have the same number of wins as the Conference B runner-up. This wouldn’t be the end of the world. Conference imbalance is something we see in both the NFL and NBA. While it can mean a few worthy teams miss out on playoff spots, it’s never the biggest deal given you have leagues of 30 to 32 teams. The impact will be greater in AFLW given there’s 10 sides and only four finals spots. 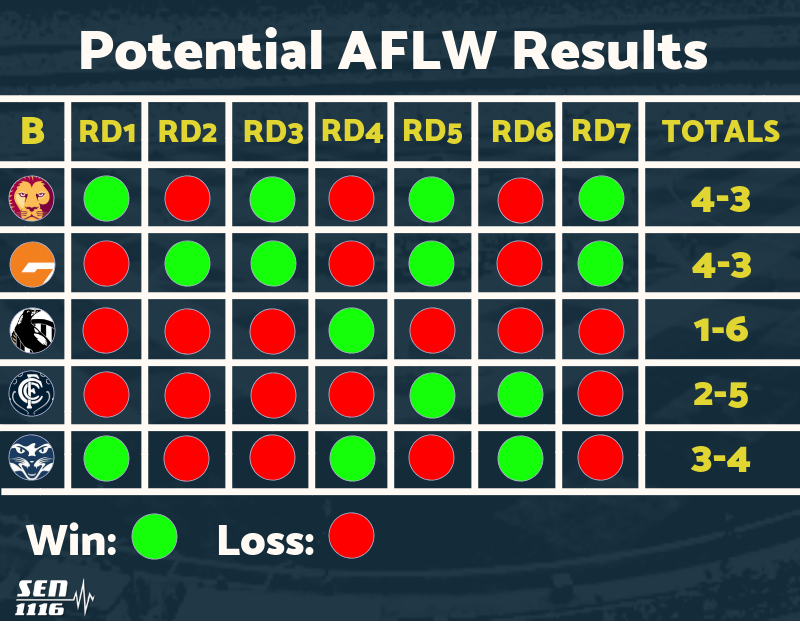 The AFL Women’s competition is still a low-scoring game where the talent is spread quite thinly across the league. This leads to a lot of close games and a lot of upsets. This makes it quite unpredictable – which is part of the charm of the competition. Anything can happen on any given day. However, there does appear to be a slight imbalance in the structuring of the conference system, which could see the third-placed team in Conference A left feeling a little miffed come finals.